Nobody “Bod” Owens gets off to a Harry Potter-like start in life when his family is killed and he is nearly murdered in his crib. Bod escapes largely due to chance and his adventurous spirit, and is adopted by the benevolent ghosts in a nearby cemetery, where he is granted the Freedom of the Graveyard. Bod is able to gain a unique glimpse into their world but, because he is a living boy, he is never able to fully become a part of it. Although the graveyard provides some frights and dangers of its own, the constant threat comes from the world outside, where the man who murdered Bod’s family searches for him still. Neil Gaiman brings the graveyard to life, giving it a culture all its own, including holidays and traditions. The ghosts from various periods provide a light primer on significant events in English history, including the Roman invasion, the plague, and the witch trials. 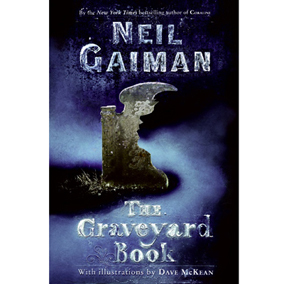 A book that takes place almost entirely in a cemetery has the potential to be boring, but Gaiman uses the setting to advantage, rather than allowing it to limit the scope of the plot. The mood of the book is only enhanced by the eerie black and white illustrations by Gaiman’s frequent collaborator, Dave McKean. Like Coraline, The Graveyard Book is a dark and scary tale, but Gaiman leavens the gloom with humour, wit and sometimes downright absurdity. For example, the less-than-benevolent ghouls of the graveyard have, with cheeky self-importance, named themselves after famous political figures from around the world. Gaiman caps the book off with a bittersweet ending which trusts that young readers are capable of appreciating and understanding more narrative complexity than many authors give them credit for. Combined with Gaiman’s high-level vocabulary, this is an excellent selection for precocious readers, or for parents and children reading together. Although there are some asides designed to help young readers understand things that are obvious to the adult reader, this is otherwise an excellent read for grownups as well as children. I have had this book on my list for years, but haven’t gotten around to reading it. However, I recently(ish) read American Gods (and reviewed it: http://bookingitup.wordpress.com/bookingitup.wordpress.com/2012/06/11/americangods/), and absolutely loved it, so this one has been bumped up a few slots. Even though I’m not a kid, I can’t wait to read The Graveyard Book!